Dr Jengo's World: TMNT: Out of the Shadows finally Out of the Shadows for PSN? TMNT: Out of the Shadows finally Out of the Shadows for PSN? 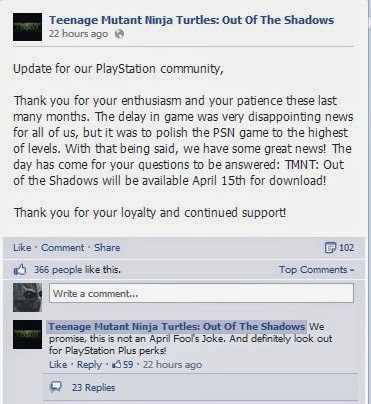 In a surprise update, TMNT: OOTS's Facebook page stated that the game will finally be out for the Playstation Network. Even more surprisingly, was that this update came on April Fools' Day.. They were quick to update that this wasn't an April Fool's Joke though, so looks like we will finally get to see it. There will also be Playstation Plus perks, so I'll be keeping a watchful eye on those. There were a lot of problems with the game when it released on other platforms late last year. So, this delay for the PSN may be a blessing in disguise. Anyone else excited for this game or have you all given up on this game already?